Transportation :- Well linked transportation facility through Buses and Autos is being provided so that the students residing at different locations of city could be transported comfortably. Computer Center:- In this changing phase of science, computer has become a nerve center of modern education. It is necessary that each child learns how to use the computer. The school provides an updated computer section which enables the child to become computer savvy. Vidio Visual teaching aids :- The teachers are encouraged and trained to use the multimedia as a teaching aid on regular basis. An extensive library of Audio, Video, CD’s transparencies and internal facilities enhances the teaching techniques making learning fun for the students. Books are friends come let us read. Swami Vivekananda Academy Plans to have the facility of well stocked library with all kinds of books and magazines which may be useful for over all knowledge of the students. The library will be equipped with Audio Video devices so as to make it best one in all respects. Drinking Water :- The school is providing clean and filtered water. Medical Facility :- Regular medical check ups are organized by the school and a health card for each student is maintained. This will ensure a check on the growth chart of the students. Sense and sensibility, pride and prejudice, creativity and talent all play their parts through cultural and creative activities. The school offers a series of co-curricular activities to develop the individual personality and potential talent of the ward, which match perfectly with curricular programmers. These activities teach leadership qualities. They serve to channels emotional and physical energy and provide preliminary training in a vocation in which the student would specialize at a higher educational level. Indoor and outdoor games activities like music, dance, yoga, drawing, painting, karate, shooting, skating, instrumental music, gardening, sculpture, Excursion tours are conducted to help and facilitate furtherance of talent in aesthetically fields. Educational trips are taken every months to give the child the practical knowledge. “HEALTHY MIND LIVES IN A HEALTHY BODY”. Keeping this in view and to canalize the energy of the youth in a proper way the school will be providing extensive play grounds. Facilities for Indoor games like Table tennis, Carom, etc. and outdoor games like, Badminton, Cricket, Basketball will be provided apart from the studies. Stress will be given for different sports and games for physical and mental fitness of the students. The school maintains a close and regular contact with parents through periodic circulars from Principal. The school Diary keeps the channels of communication open between teachers and parents. Parents Teachers meeting are held at regular intervals to discuss the progress of the students. The Boarding facility opens an opportunity to the students from remote areas for an affordable quality education. The school provides boarding facilities for the girls at present, from class 5th onwards. The hostel area has well furnished dormitories and a common room for entertainment in leisure time of the boarders. Regular English classes are held to improve the communication skills. Evening prep time is held to help the boarders in their school’s work and to bring about their academic excellence. 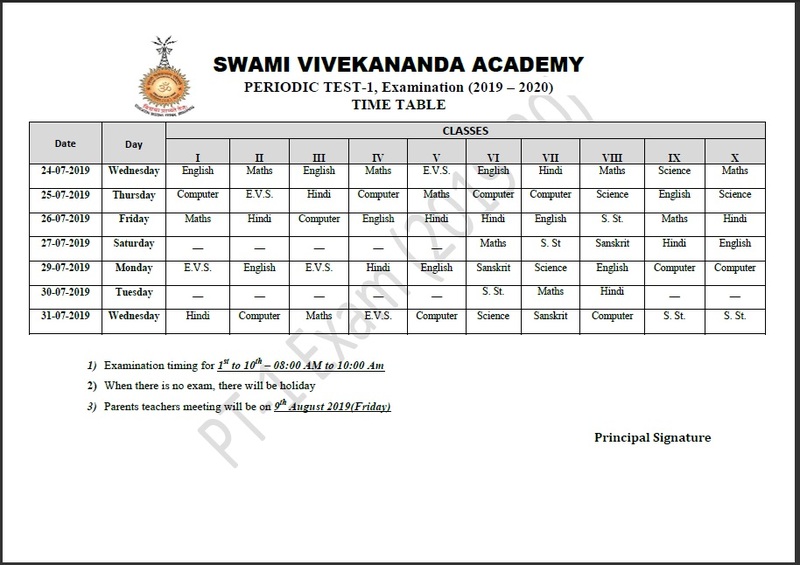 Copyright © 2014 Swami Vivekananda Academy All Rights Reserved.